It is springtime in Nepal; colorful rhododendrons in full bloom, birds singing, yak bells ringing. With the excitment and energy throughout Nepal from the Everest climbing expeditions currently underway, Berg Adventures is taking along four Canadians and one American through one of the most tranquil and beautiful areas in the world; the Khumbu Valley. From Namche Village onward, they will be surrounded by giant mountains with snow capped peaks as far as the eye can see! Following the beaten path up through the Khumbu Valley they will be immersed with tradition, religion, history and culture. The destination - Everest Base Camp at 17,500 feet (5333 meters). 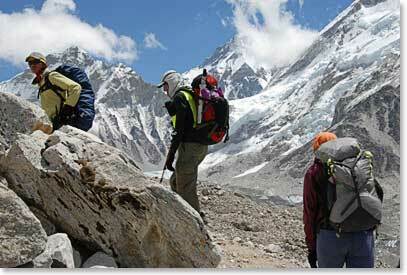 Stay tuned as well will send daily dispatches our this unforgettable adventure in Nepal. May 8, 2009 – Team Summits Kala Pattar 18,300ft! April 27, 2009 – Changes in Nepal and the Team is Underway!